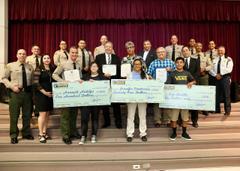 In celebration of Hispanic Heritage month which honors the impact the Hispanic culture has made throughout our Nation’s history; Palmdale Sheriff’s Station co-hosted our second annual Hispanic Heritage Essay Contest at Los Amigos School. Eighty 8th grade students participated in writing an essay about a historical person who has influenced their life. On Monday, October 1, 2018, the winning students were announced in a ceremony in front of their classmates and parents. In attendance were also Los Angeles County Sheriff’s Department Commander Darrell Bolin, Captain Dennis M. Kneer, Palmdale City Mayor Jim Ledford, California Assemblyman Tom Lackey, and Los Amigos Principal Sonia Salcdo. The hardest part for Palmdale Station was deciding the top three essays to choose as all students did a wonderful job. The Hispanic Chamber of Commerce and Ventura Graphix awarded the three winning students a monetary donation and Mulligans Family Fun Center donated passes to their theme park. We hope they have fun at the attractions after all their hard work.